Click here to download Midnight Mansion 1.2.0b for MacOS X. This is a free upgrade to owners of any older version of Midnight Mansion. Note: if you get an .exe file, try downloading with Safari instead of FireFox. To upgrade from a prior version of Midnight Mansion, first open your old Midnight Mansion folder and drag the Custom Mansions folder to the desktop. Then drag your entire old Midnight Mansion folder to the trash, and put the latest version's Midnight Mansion folder in its place. (Don't worry, your saved games, high scores, and license file will not be thrown out when you do this, as they're stored elsewhere on your computer.) Now drag your Custom Mansions folder back into your new Midnight Mansion folder, choosing to replace the one that's in there. That's it! This will bring up a Finder window. Find "MidnightMansion.dmg" in this window, then double-click it. This will put a new icon called "Midnight Mansion Disk Image" on your desktop. 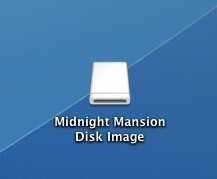 Double-click "Midnight Mansion Disk Image." (It may also say "Midnight Mansion Install.") A new window will appear. Inside, you'll find a Midnight Mansion folder. Drag this to your computer's applications folder. You can now drag both MidnightMansion.dmg and Midnight Mansion Disk Image to the trash. To play the game, just open your Applications folder and find the Midnight Mansion folder inside. 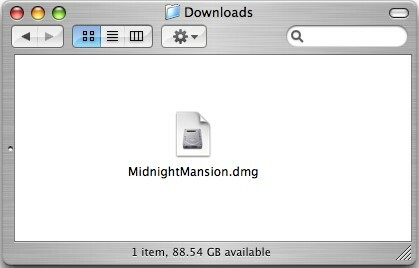 Click this link if you want to download Midnight Mansion 1.0.3 for MacOS 9. Version 1.0.3 was the last release for MacOS 9. If you experience problems downloading, try holding down the Option key while clicking the link.